After we moved out of the city (yes, NYC, “the city” forever), we realized that we needed some reliable ways to keep in touch with that vibe. Regular visits and chats with people who live there still (y’all are BUSY!) are good, but radio is better. We can listen to WFMU and WNYC and feel transported. We’re also getting to know local radio in our new neighborhoods and we think you should get to know yours, too! 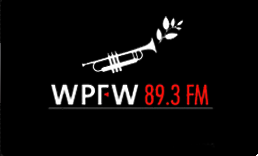 MRB has recently been obsessed with WPFW “Jazz and Justice” 89.3 in Washington, DC … for obvious reasons. Radio still connects us in ways that other media just can’t, and we love that. Get to know your local free-form or public station, donate money to help sustain them, and spread the word - we’d love to hear about the stations that connect you to where you’re from.